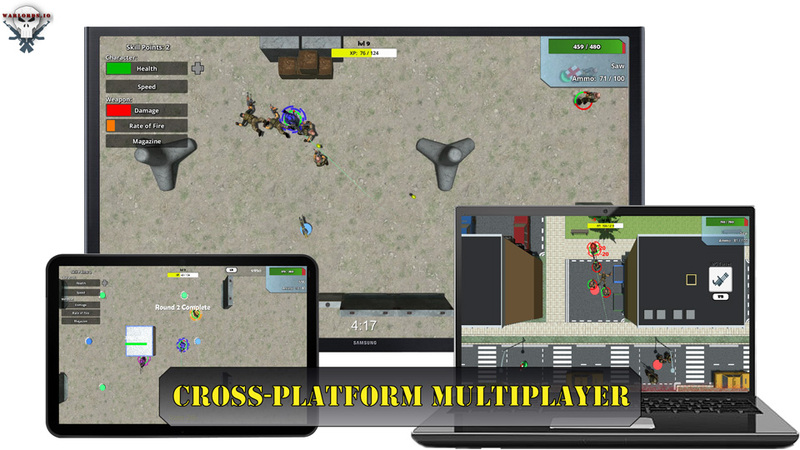 We describe it as a "Cross-platform Class-Based Top-Down-Shooter with 4 Player Split-Screen". We want people to play together on any device, period. I love my Xbox and my PS4 equally, but our group of friends can debate which is better ad nauseam (PC is better than everything, though). At the end of the day we just enjoy playing Rocket League, Halo, and COD together. So in our minds, a good multiplayer game should be playable with your friends no matter which platform you're on. Sometimes 4 controllers isn't enough for all of us, so we're constantly passing controllers. This sparked the idea of being playable on mobile devices. Let's say 6 friends come over to play that sweet new Warlords.IO game, but you only have 1 console and 4 controllers. No Problem! Your 2 other friends can simply download the mobile version for free and play in the same match as everyone else, both online or on LAN. At launch, Warlords.IO will feature 4 unique classes with their own abilities and primary weapons that players can choose from to fill their desired playstyle. Today's shooter games have definitely fell into the trend of having multiple playable character classes designed to fill specific roles on the battlefield. Our 4 playable classes have 4 broad roles that can be played, but greatly tweaked and fine-tuned with the choice of primary weapon and player ability. The Soldier, for example, is designed to constantly be in a fight. His three ability choices are: Stim-Shot, Rocket Launcher, and Akimbo. The choice of Stim-Shot gives him the ability to quickly heal in dire situations and continue fighting, instead of having to retreat and search for a health pack. The Rocket Launcher will allow the Soldier to quickly dispatch enemy camps to ramp up is XP gains. And there's nothing more enjoyable than using the akimbo ability to dual-wield 2 of your primary weapons and rain lead upon your enemies. I loved playing simple Top-Down Shooters as a kid, and I think their mechanics can still old up today in arcade and arena style shooters. Twin stick shooters have been done numerous times in the indie market, but the best ones add unique twists to the formula. With Warlords.IO, we plan to stand out from the pack by being one of the few (maybe even the only) game that is playable cross-platform both cooperatively and competitively on PC, Console, AND Mobile devices. We also hope our class-based mechanics resonate with players and plan to expand the selection of classes over the life cycle of the game. When / Where / How do I play Warlords.IO? Our goal is to be playable on every console (Xbox, PS4, Nintendo Switch), PC, and Android mobile devices. We are working towards launching on at least 3 of these platforms by the end of this year and will let our community know when to expect further releases ASAP.